During the mid-1870s, about the time of the Philadelphia Centennial Exposition, printing processes hit a new height and little slices of Americana now referred to as trade cards quickly became popular with Victorian collectors. Today, collectors once again seek these old-time predecessors to modern day business cards. The main difference between trade cards and business cards is that trade cards focused on the big picture rather than introducing a single individual. They not only advertised a brand name and/or a business, but many times a specific product would be mentioned on the card as well. Exhibitors hawking products at major exhibitions handed out thousands of these graphically pleasing cards. Many of these feature vivid coloring, interesting typography, and popular themes of the day, not necessarily representative of the product they were selling in some cases. What kinds of themes are we talking? Adorable children, pretty women, and sports figures all had a huge roll in advertising in the late 1800s, and they all showed up frequently on these types of cards. Popular tourist attractions of the day, like Niagara Falls and the Statue of Liberty, made their mark as well. 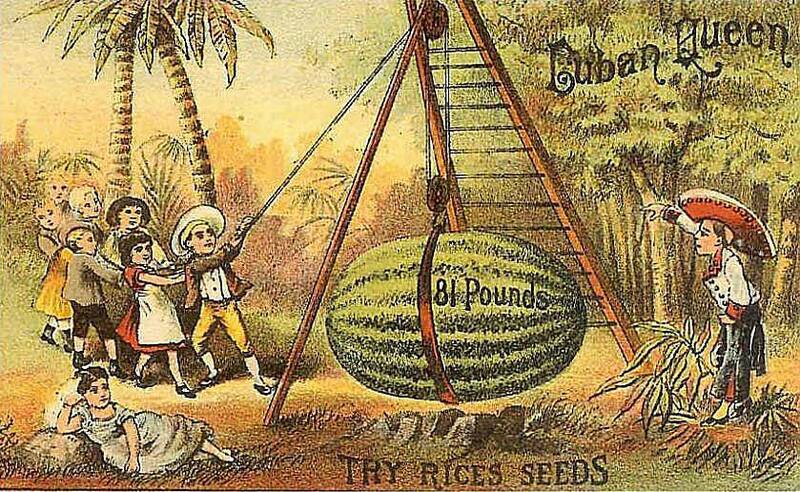 In fact, if it was a part of American life during the Victorian era, what we would call popular culture today, then chances are you’ll find that subject depicted on a trade card as well. As for the types of products most often featured on trade cards, medicine, food, tobacco, clothing, household items, sewing goods, stoves, and farm equipment often won the popularity contest. Grocers distributed cards for the food products and household goods they regularly stocked. The local cobbler would employ them to promote shoe oils, creams, and polishes. You can even find trade cards “selling” political candidates if you look around enough. One interesting fact about these cards, like their later turn of the century postcard cousins, is that they were actually avidly collected and kept in ornately covered scrapbooks back when they were new. This craze lasted well into the 1890s. Those handy scrapbooks are often in tatters when they’re plucked from dusty attics and barns today, but the pasteboard cards inside can be in remarkably good condition. This accounts for modern collectors being able to find so many wonderful trade card examples available for their collections today. The trade cards collected back then were sometimes pasted in those albums and this can present a problem when glue residue is evident or the advertising message is torn away on the back of the cards. Other damage like and thinning of the cards can be sustained as well when these are removed for individual sale. Cards bringing the most in collector's markets today are those with clean backs and free of other condition issues. While trade cards really didn’t have many avid seekers until the 1960s or so, there are many collectors today who regularly buy, sell, and trade these cards at ephemera shows and through online venues. Many of these cards can still be purchased for just a dollar or two making it an affordable option for collecting. On the other end, putting together a complete set of a card series one by one can be challenging, but also rewarding. Take the series of cards featuring Baron Munchausen - a Russian cavalry captain in the 1700s known for recounting excellent tales about his war, hunting, and travel adventures - as an example. Putting together a complete set of ten cards featuring the Baron’s tall tales, which advertised Little Joker Tobacco, can be almost impossible now and very costly at least $100, and sometimes much more, apiece. Another popular type of cards with collectors are die cut examples. From cards cut out to resemble cream cans, to those shaped like watermelons or the Hires Root Beer boy, these interesting little pieces of Americana can be quite fun to find and add to a collection. You might be competing with enthusiasts seeking all types of soda memorabilia, breweriana, petroliana or any number of popular advertising themes to get them, but that’s all a part of the thrill of the chase collectors know so well.